Pakistan wants Kashmir because at the point of the partition (and still is to this day), Kashmir was a predominantly Muslim region. Therefore, Pakistan is looking out for what it considers its people (indeed Pakistan was created with the intention of creating a country for all Muslims in British India). India wants Kashmir because .... well, because why exactly? Would the costs of going to war over Kashmir (casualties, resources, etc.) really been worth it for India? Note that this question is not a duplicate of the other question which asks for what claims each country has. I know India's official claim, which is that Kashmir used to be ruled by a Hindu person. But I do not feel that alone is reason enough for all the battles fought over Kashmir. Does India really value the opinions of one Hindu person over the opinions of all the Muslims in the region so much that they might be willing to go to multiple wars for it? I will try to touch on all aspects here. As you have rightly pointed out, Kashmir was ruled by a Hindu ruler during that time(Maharaja Hari Singh). Now, Hari Singh was a stupid ruler. The British had given the Princely states the choice between the two dominions at that time. Hari Singh intentionally delayed his decision. Obviously, the Pakistani Establishment got impatient as Hari Singh refused to give a concrete decision(Pakistan had assumed that Kashmir would be theirs due to it being Muslim-majority). So, when Pakistan occupied some regions of Kashmir, Hari Singh realized his own folly and signed the Instrument of Accession. Indian soldiers were air-lifted into Srinagar and they took back almost 2/3rd of the region before the UN became involved. Jawaharlal Nehru, India's first Prime Minister, was a Kashmiri Pandit and he has been accused by modern-day "nationalists" to be too emotional with the Kashmir issue. In any case, India claims Kashmir because its then-ruler had signed the instrument of accession. The natural terrain of Kashmir is hilly. The mountains act as natural barriers to any invading army. Keeping control of these peaks is essential for India's own safety. In the Kargil War, Pakistani soldiers took control of a very important strategic point, Tiger Hill. Indian soldiers went to the very extreme to capture Tiger Hill back from the Pakistanis because of its strategic importance. Similarly, in 1984, Operation Meghdoot was launched by the Indian army to capture a strategically important Siachen Glacier. The three major rivers that flow through Jammu and Kashmir are Jhelum, Chenab and Indus. According to the Indus water treaty, these rivers are controlled by Pakistan. However, as these rivers originate in India, India can use them for irrigation,transport and hydro-power generation. Water is the most scarce resource in the whole of South-Asia. Thus, control over Kashmir gives India the control over its rivers and by extension gives them an edge in geopolitical issues facing the region. Kashmir was (and still is) a Muslim majority state of undivided India in 1947 ruled by a Hindu prince Maharaja Hari Singh. The Kashmir crisis started along with the signing of accession accord with the Republic of India by Hari Singh. There were Pakistani invasions and Chinese claim of Kashmir in 1947 which split Kashmir into three parts. 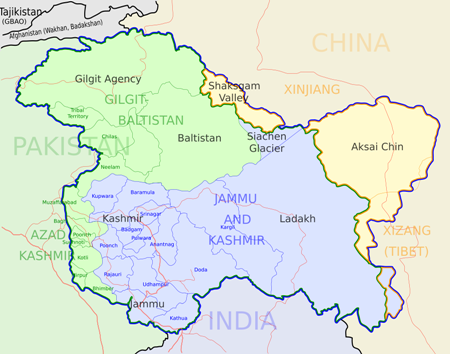 Indian administered Kashmir is known as Jammu and Kashmir (plus, part of Siachen Glacier). Note that, Gilgit-Baltistan joined Pakistan voluntarily. Pakistan Army took control of this area later. Azad Kashmir was occupied by Pakistan by invasion. Grabbing Kashmir is a part of a greater plan of rebuilding Akhand Bharat. Akhand Bharat is the ideology of the Indian Hindu extremist group RSS with which BJP holds the common ground. Akhand Bharat’ idea behind RSS cover for talks with Pak.? The main binding force of India is the Hindu nationalism or Hindutva which originated during the British rule at the start of 19th century. Note that, because of the Napoleonic wars, the Europe saw the rise of Nationalism. Indian people, as part of the citizens of the British empire, started to go to Europe for higher education. The Western education gave rise to Indian Nationalism. Hinduism played a significant role in this regard. As Muslims were outsiders and invaders, it was convenient to find a hero, who is indigenous and can be taken as a symbol of Indian unity. That hero was Emperor Bharata who ruled Akhand Bharat during the Vedic era. There was also a historical analog of Bharata. Ashoka Maurya unified the entire India and expanded India to its greatest extent as well. India has been unified under many emperors and governments in history. Ancient texts mention India under emperor Bharata and Akhand Bharat, these regions roughly form the entities of modern-day greater India. The Mauryan Empire was the first to unite all of India and South Asia (including much of Afghanistan). Grabbing Kashmir will humiliate and debilitate India's last enemy in South Asia and the only arch-enemy in the world Pakistan, and hopefully, begin the start of a new foundation of Akhand Bharat. Now, the relevant question is: What about the other parts of Akhand Bharat? Well, India almost at the control of the Akhand Bharat except for its arch-enemy Pakistan. Grabbing landmasses is not the only way to build empires. Creating hegemony is another tool. We can take the examples of Russia's Putin and Turkey's Erdogan. Putin and Erdogan are reportedly obsessed with the revival of their respective empires (e.g. Russian/Soviet Empire and Ottoman Empire). Well, this is a endless debate but still I clear your doubt, India does not want Kashmir, but it is the integral part of Republic of India. At the time of dual theory was being implemented it was said that any province can choose any of the nation i.e India and Pakistan as well as they can maintain the neutral status and can run their state as independent under their own rule so somewhere around 1948 Raja Hari Singh signed the instrument of accession and become a part of India. 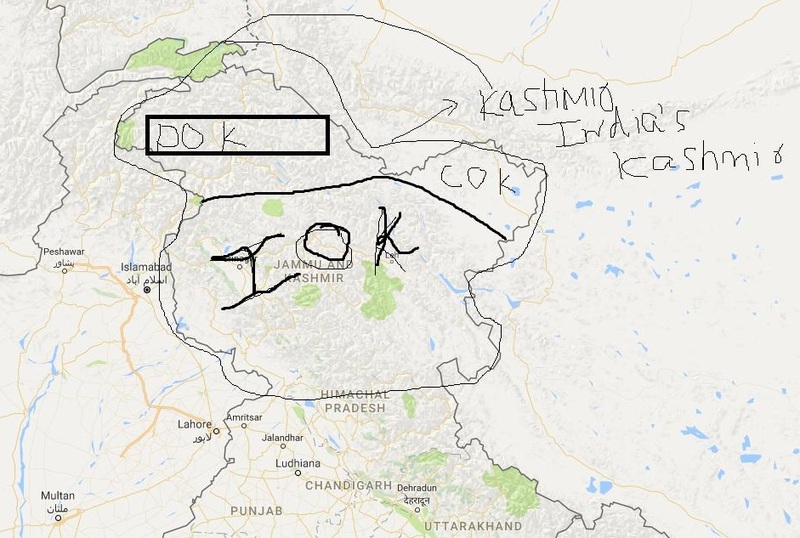 Before that the Pakistan military (Kabilai) attacked the State of Kashmir and try to annex that forcefully and in counter attack Indian forces attack the Pakistani troops. Also, states were not divided on the basis of the majority population, they were came under the rule only after the letter of annexation being signed by the princely states. You got half the information right. Pakistan was created solely to tend to the Muslims in British India. That does not mean that India was made for the Hindus. In fact, India was open to anyone who wanted to be Indian irrespective of their religion. That explains why a lot of Muslims did not move to Pakistan when they had the choice. India today has more Muslims than Pakistan. Coming to the question, the Mountbatten Plan clearly had left the choice to the rulers of the land. The ruler of Kashmir wanted to join India, and he did. It was left to the Muslim population of Kashmir to go to Pakistan if they so desired. If India wanted Kashmir so much then what stopped it from taking back Gilgit Baltistan and POK area of Kashmir, which are still under illegal control of the Pakistan Government. When ruler of Kashmir, Maharaja Hari Singh signed instrument of accession Kashmir became integral part of Republic of India. Entire Kashmir not just the present day Kashmir on the Indian side. On the contrary, the desperation of Pakistan to occupy Kashmir is quite evident, be it from the regular state sponsored terrorism or going to war with India. India has only defended its terroritory from external aggression and it will continue to do so. For Pakistan, Kashmir is an obsession and a bait for the radical elements it harbours. This is an ongoing process, ever since it's inception. Not the answer you're looking for? Browse other questions tagged war india pakistan kashmir or ask your own question. Why do governments still assume that “the more land, the better”?